HISTORY｜OUR STORY｜The official website of Oisix ra daichi Inc. In October 2017, Oisix and Daichi wo Marmoru Kai merged and established Oisix.dachi Inc. A merger with Radish Boya is planned for October 2018 wherein anticipation for its establishment, is proceeded by the changing of the company name to Oisix ra daichi Inc.
Daichi wo mamorukai was the first ever company to deliver organic agricultural products to households in 1985. Here are the stories and memories that we deeply cherish. In 1975, the chairman of Daichi wo mamorukai Mr. Fujita was deeply inspired by the ideas of Ernst Friedrich Schumacher’s novel “Small is beautiful” and Sawako Ariyoshi’s “The complex contamination”; the idea that the advancement of productivity does not make the society a better place and the usage of agricultural chemicals was corroding the society. Around the same time he also met a doctor who was actively promoting the benefits of organic agricultural products. More research into the subject and conversations with local farmers lead him to believe that it was too difficult for local farmers to survive in the market during that time if the farmers were not to use pesticides. 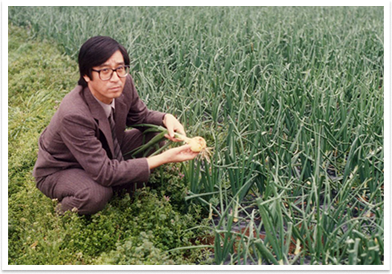 He wanted to to find a way to successfully distribute organic agricultural products to the public and ultimately fulfill his goal of developing the primary industry in Japan. The operations of Daichi wo mamorukai began in Aozora City with the slogan that said “Instead of promoting the danger of pesticides, let’s have our customers taste our delicious radish.”. Although safety was guaranteed, organic agricultural products were not visually appealing enough and it was really difficult for us to find the right market for it. However under these difficult circumstances, we insisted on selling the products directly to the public. This strategy turned out to be a success and the increase of customers eventually allowed the company to start regular monthly delivery to their customers. 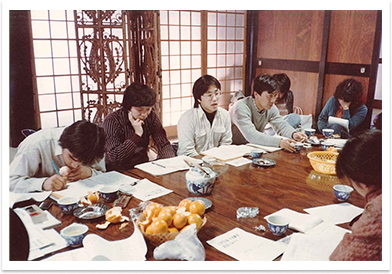 In 1975, we established Daichi wo mamoru shimin no kai(later to be Daichi wo mamorukai) and systematized its operations for further expansion. 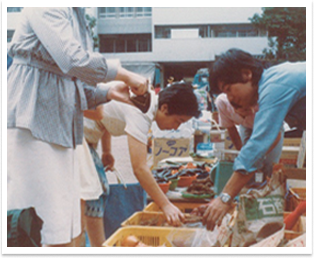 In 1977, the company was involved in the organic expo in Seibu department store in Ikebukuro Tokyo, which was a turning point for further growth of the company. 2 years after setting up the company, we were able to hire full-time staff but started to feel the limits of the company as it wasn't a corporation. We turned the company into a corporation with the support of manufacturers and our customers. Back then, corporations were normally set up for commercial reasons but we insisted on protecting and helping the manufacturer sell their products so that consumers can live a healthier life. In the early 80s, women was beginning to take major roles in the workforce which lead to a decrease in number of group purchasing organizations. Around the same period of time the home delivery service was being tested in distribution centers at night. It was instantly a success because it suited the needs of customers. This test in the early 80s eventually became the base model for modern food delivery service. We are always looking at solutions to solve agricultural and environmental problems by making correct business decisions. Here are a few examples of promotional movements and campaigns that took place. 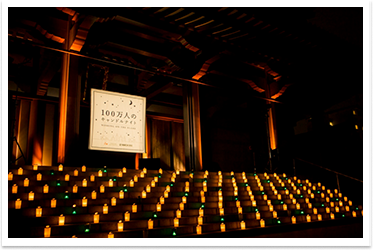 In 2003, We started the event “Candle night of one million people” with the slogan of “Turn off the lights, and enjoy a slow night.”. The idea is to turn off household lights during a specific day in the summer and winter to promote the importance of saving electricity. By having people around the world participate together on the same day, We believe that it will bring people from different countries closer. Organic Festa is an expo that is held every year with a different theme. 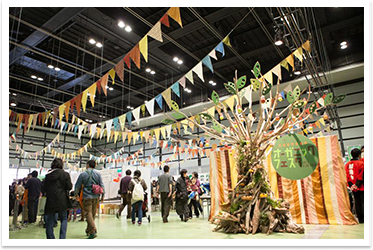 In the early days of this event before it was called Organic Festa, it used to be called Tokyo Assembly and was an event that allowed manufacturers and consumers to meet and share information. Back then business was contract based so it was important for both sides to meet in order to build trust. 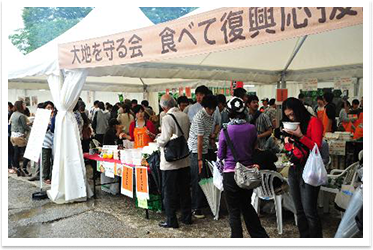 Nowadays manufacturers, consumers and carriers all participate and the Organic Festa has become the most important event for us every year. After the Great East Japan Earthquake, citizens of the area was left with harsh and saddening realities. We took the responsibility to connect manufacturers and consumers to provide proper assistance. During that time we also began to look for an alternative way to produce energy. We were involved in the rescue of The Great East Japan Earthquake by delivering food to the shelters and have continued till today. In May 2013, We partnered with “北京富平学校(Beijing Fu-Ping Development Institute)” to establish “富平創源(Yogeev)” to help rural areas in poverty. Yogeev’s goal is to improve the relationship between local manufacturers and consumers to promote organic agricultural products in the local area.